Mountains I have climbed and remember. Here is a overview of most mountains I have climbed Norsk tekst. 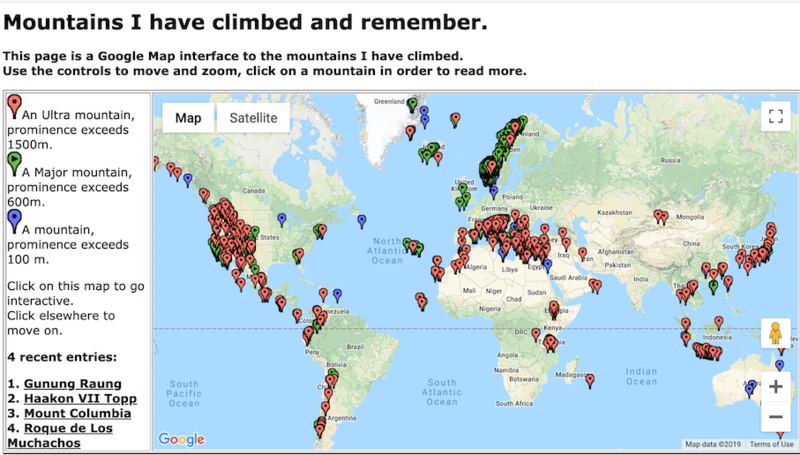 Mountain climbs, route descriptions and trip reports from all over the world, in particular Norwegian peaks, the Colorado Fourteeners, the Alps, even five of The Seven Summits (Aconcagua, Denali, Kilimanjaro, Elbrus and Kosciuszko). There is extensive coverage of peaks from North-East Greenland, including many first ascents. 1. Stetinden, 31/3 Lyngen, Norway. 2. Giilavárri, 29/3 Lyngen, Norway. 3. Punta de los Roques, 17/3 Palma. 4. Montana la Barquita, 16/3 Palma. 5. Volcan de la Deseada, 16/3 Palma. 6. Roque de los Muchachos, 15/3 Palma. 7. Pico Bejenado, 14/3 Palma. 8. Beroch Wuha, 27/2 Ethiopia. 9. East of Silki, 27/2 Ethiopia. This mountain page uses a "primary factor" (in the US called "prominence") of 100 meter (in the US 300 feet) to rank a summit. Peaks with a smaller drop to its (higher) neighbor may be noted/described in the text, but do not qualify for a separate listing. A few exceptions exist, but they are always noted with a comment saying "No Rank" in this main list. The level of difficulty is normally given using the American (YDS) scale, see here for further explanation. Go see: **** The Major Mountains of Norway ****. Sjekk ut: **** Norges Hovedtopper ****. A. Read (in Norwegian) about pioneering map surveying of Norwegian mountains. B. The 100 most prominent mountains from many parts of the world. C. Extensive information about mountains and mountaineering in East Greenland. E. Mountains climbed sorted according to prominence (primary factor) down to 600 meter. F. My "Fan-out" principle of prominence based climbing. I appreciate that use of these data is acknowledged, including a link to my main mountain page. 1 Aconcagua 6962 m. January 29. 2002 Highest in the Southern and Western Hemisphere, highest in Argentina. 2 Nevado Ojos del Salado 6893 m. January 8. 2011 Climbed both summits. Chile/Argentina. 3 Chimborazo 6268 m. December 17. 2008 Highest in Ecuador. 4 Denali 6194 m. June 14. 2006 Highest in North America. 5 Cerro Vicuñas 6090 m. January 10. 2011 Chile. 6 Mount Logan 5959 m. June 3. 2009 Highest in Canada. 7 Cerros Cañapa 5900 m. January 2. 2011 Bolivia. 8 Cotopaxi 5897 m. December 14. 2008 2nd. highest in Ecuador. 9 Kilimanjaro 5895 m. October 1994 Highest in Africa, highest in Tanzania. 10 Tomasamil 5853 m. January 4. 2011 Bolivia. 11 Cayambe 5790 m. December 19. 2008 3rd. highest in Ecuador. 12 Cristobal Colon 5730 m. December 13. 2015 Highest in Colombia. N*N Pico Bolivar 5730 m. December 6th. - 14th. 2017 Unsuccessful. 13 Elbrus 5642 m. August 5 and August 8, 2004 Highest in "Europe", One of the 7 summits. 14 Citaltépetl 5636 m. December 30. 1978 3rd highest in North America, Mexico HP. Also called Pico de Orizaba. 15 Damavand 5610 m. August 14. 2007 Iran HP. 16 Cerro Chorolque 5570 m. December 31. 2010 Bolivia. 17 Popocatépetl 5465 m. January 2. 1979 2nd highest in Mexico. 18 Ritacuba Blanco 5410 m. January 12 2012 Highest in Cordillera Oriental, Colombia. 19 Catedral 5295 m. January 31 2002 Near Aconcagua. 20 Volcan Iztaccihuatl 5230 m. December 6 2018 3rd. highest in Mexico. 21 Concavo 5173 m. January 14 2012 El Cocuy National Park, Colombia. 22 Ararat 5137 m. August 9. 2007 Turkey HP. 23 Margherita Peak 5109 m. January 4. 2010 Uganda HP. 24 Cerro Cunurana 5071 m. December 30. 2010 Bolivia. 25 Bonete 5060 m. January 27, 2002 Near Aconcagua. 26 Mount Blackburn 4996 m. June 10, 2009 Highest in Wrangell Mountains. 27 Pico Bolivar 4988 m. January 8, 2008 Venezuela HP. 28 Cotacachi 4944 m. December 11. 2008 No.11 in Ecuador. 29 Pico Humboldt 4925 m. January 6, 2008 2nd. highest in Venezuela. 30 Mount Speke 4890 m. January 2, 2010 Rwenzori, Uganda. 31 Mount Baker 4844 m. January 5, 2010 Rwenzori, Uganda. 32 Mount Blanc 4810 m. August 19, 1974 Europe HP, Alp HP, France HP. 33 Cerro Rico 4791 m. December 29. 2010 Bolivia. 34 Pichincha 4784 m. December 9. 2008 No. 15 in Ecuador. 35 Volcan Cumbal 4764 m. December 18. 2017 Colombia. 36 Cerro Wila Chanca 4701 m. December 28. 2010 Bolivia. 37 Nevado de Toluca 4690 m. December 4 2018 4th. highest in Mexico. N*N Mount Fairweather 4671 m. May 23, 2011 Highest in British Columbia, Canada. Did NOT summit. 38 Dufourspitze 4634 m. May 3, 2008 Switzerland HP. 42 Volcan La Malinche 4430 m. December 2 2018 Mexico. 43 Ras Bwahit 4430 m. February 24, 2019 Ethiopia. 44 Silki 4420 m. February 27, 2019 Ethiopia. 45 Mount Whitney 4417 m. August 1977 Highest in the lower 48 states. 46 East of Silki 4412 m. February 27, 2019 Ethiopia. White Mountain Peak 4344 m. October 15, 2005. Cold and windy. Mount Shavano 4337 m. May 20, 2001 The Angel of Shavano. Mount Princeton 4327 m. June 14, 2001 Strong wind, 3rd try ! Grand Combin 4314 m. September 15, 2012 Swiss Alps. Tabeguache Peak 4314 m. May 20, 2001 25th., Nice View! Capitol Peak 4307 m. July 19, 2002 Knife Edge ! Snowmass Mountain 4295 m. July 14, 2002 Traverse, the snow has melted. Culebra Peak 4282 m. August 22, 2003 My final Fourteener. Mount Lindsey 4280 m. August 24, 2002 Completion of "the ABC"! NR North Eolus 4279 m. July 11, 2001 No rank, but a nice place. Beroch Wuha 4272 m. February 27, 2019 Ethiopia. Amba Farit Peak 4270 m. February 18, 2019 Ethiopia. Abune Yosef 4260 m. February 20, 2019 Ethiopia. Volcan Galeras 4256 m. December 19, 2017 Most active in Colombia. Mount Silverheels 4213 m. April 3, 2007 No 96 in Colorado, High Wind! Mount Boising 4150 m. June 25. 2014 Finisterre Range HP. First ascent. Kings Peak 4123 m. July 26, 2008 Utah HP. Guna Terara 4120 m. February 22, 2019 Ethiopia. North Arapahoe Peak 4115 m. August 1997 Highest in Indian Peaks, windy ridge. Barre des Ecrins 4102 m. May 23, 2010 Sharp ridge! Choqa 4100 m. February 17, 2019 Ethiopia. Apache Peak 4097 m. September 23, 2000 2nd in Indian Peaks. Kinabalu 4095 m. July 29, 2006 Polished granite, Sabah, Malaysia, Borneo HP. Sundog 4094 m. July 6, 2000 300rd in Colorado. Also "Point 13432"
Navajo Peak 4087 m. October 1, 2000 3rd among Indian Peaks. Inatye 4075 m. February 23, 2019 Ethiopia. M'Goun 4071 m. June 26. 2017 Slept on the summit. Morocco. Gran Paradiso 4061 m. April 19, 2008 Highest in Italy. James Peak 4052 m. November 4, 2000 5th among the Indian Peaks. Mount Audubon 4030 m. September 2, 2000 Nice, afternoon walk. Jacque Peak 4025 m. April 6, 2004 Ski climb and ridge walk. Wheeler Peak 4011 m. June 1993 Highest in New Mexico. NR M. (Guyselman) 4005 m. August 1997 First European! N. 3999 m. August 1997 Ridge traverse. NR West of Ellingwood Point 3993 m. June 12, 2001 Soft Rank, unclimbed point? Wheeler Peak 3982 m. July 3, 2008 Most prominent in Nevada. Acatenango 3976 m. February 15, 2011 Guatemala. NR O. (Little Powell) 3917 m. August 1997 Ridge Traverse. Ortler 3905 m. August 30, 2008 South Tirol HP, Italy. Piz Palü 3905 m. June 1996 Switzerland, horrible weather! Tuktuai Peak 3889 m. June 4, 2012 Papua New Guinea. Loma Santa Cruz Chica 3889 m. December 15, 2008 Ecuador. Mount Peale 3877 m. July 21, 2008 Utah, USA. Yu Shan, North Summit 3852 m. June 26, 2007 Near Yu Shan. Cerro Chirripo 3820 m. December 4. 2007 Costa Rica HP. Little Meru 3820 m. January 22. 2019 Tanzania. Whetstone Mountain 3815 m. March 31. 2016 Colorado, USA. Cerro Ventisqueros 3812 m. December 3. 2007 Costa Rica 2nd. highest. Cerro Piramide 3807 m. December 4. 2007 Costa Rica 3rd. highest. Gunung Kerinci 3805 m. July 20. 2006 Jungle mountain! Sumatra HP. Grossglockner 3798 m. August 10. 2005 Highest in Austria. Bison Peak 3789 m. March 8. 2008 Snow struggle, Colorado. Sawtooth Peak 3762 m. June 1984 Near Mineral King, California. Cerro Terbi 3760 m. December 4. 2007 Costa Rica. Pico Sureste 3752 m. December 4. 2007 Costa Rica. Mount Adams 3751 m. May 1989 Climbed on skis, Washington. Gunung Rinjani 3726 m. July 14. 2006 Lombok HP. Cerro el Potosi 3720 m. November 13. 2018 Mexico. Diamond Peak 3719 m. July 10. 2011 My ultra no 50 in usa48, Idaho. Pico del Teide 3718 m. March 2. 2004 Tenerife HP, highest in Spain. Potosi 3710 m. November 13. 2018 Mexico. Crested Butte 3709 m. April 1. 2016 Colorado, USA. Syue Shan, North Summit 3703 m. June 28, 2007 Near Syue Shan. Gunnbjørnfjeld (Hvitserk) 3694 m. May 17. 2004 Arctic HP, highest on Greenland. Ibapah Peak 3684 m. July 2. 2008 Utah. Qaqqaq Kershaw (Dome) 3683 m. May 20. 2004 2nd. highest on Greenland. Mount Moriah 3678 m. July 3. 2008 Nevada. Gunung Semeru 3676 m. July 25. 2015 java HP. Qaqqaq Johnson (Cone) 3669 m. May 21. 2004 3rd. highest on Greenland. Grossvenediger 3666 m. April 20. 2018 Austria. Sapsap 3665 m. June 24. 2014 Finisterre, Papua, New Guinea. Sierra Blanca Peak 3659 m. July 19. 2008 New Mexico, USA. Mount Loolmalasin 3648 m. January 11. 2019 3rd. highest in Tanzania. Mount Jefferson 3640 m. October 16. 2005 Remote Nevada. Mount Nebo 3636 m. July 23. 2008 Utah, USA. 200 Charleston Peak 3633 m. November 11. 2006 Near Las Vegas. Dammastock 3630 m. May 25. 2014 Furka Pass, Switzerland. North Schell Peak 3622 m. July 4. 2008 Nevada. Jebel Igdet 3619 m. June 23. 2017 Morocco. Tödi 3614 m. July 16. 2009 Switzerland. Arc Dome 3588 m. October 17. 2005 Remote Nevada. Mount Timpanogos 3581 m. July 24. 2008 Utah, USA. Cima Presanella 3558 m. July 19. 2004 Near Madonna di Campiglio, Italy. Morasurco 3550 m. December 21. 2017 Colombia. Picacho San Onofre 3550 m. November 14. 2018 Mexico. Itkolbashi 3543 m. August 9. 2004 Baksan valley, Caucasus. Mount Temple 3540 m. July 30. 2018 Canada. Volcan Atitlan 3537 m. December 14. 2016 Guatemala. Lookout Mountain 3530 m. July 19. 2008 New Mexico, USA. Medetsiz Tepe 3524 m. July 19. 2016 Turkey. Montanas Pena Blanca 3520 m. December 11. 2016 Guatemala. Mount Ellen 3512 m. July 22. 2008 Utah, USA. San Gorgonio 3506 m. June 1993 Highest in Southern California. Styggehorn 3503 m. First ascent, May 23. 2004 Twin horns above a huge cliff. Twin Peaks 3502 m. June 1994 Snowbird, Utah. Tomichi Dome 3497 m. March 30. 2016 Colorado, USA. Twin Sisters Peaks 3484 m. August 15. 2012 Colorado, USA. Mulhacén 3479 m. December 20, 2003 Highest in Sierra Nevada, Spain. Unnamed, north of Arc Dome 3477 m. October 17, 2005 Big mountain north of Arc Dome, Nevada. West of Medetsiz Tepe 3431 m. July 19. 2016 Turkey. Mount Hood 3426 m. June 23, 2006 Highest in Oregon. Piz Kesch 3418 m. August 31, 2008 Switzerland. Mount Hanang 3417 m. January 14. 2019 No. 4th. in Tanzania. Nebo North Peak 3406 m. July 23. 2008 Utah, USA. Pico de Aneto 3404 m. September 5, 1997 Highest in the Pyrenees. Mount Hector 3394 m. July 29, 2018 Canada. Pico de Posets 3375 m. September 1995 2nd Highest in the Pyrenees. Mount Baldy 3374 m. July 27, 2008 Snowbird ski resort, Utah. Gunung Sumbing 3371 m. July 20, 2015 Java, Indonesia. Telescope Peak 3368 m. July 1997 Highest in Death Valley. Sugarloaf Mountain 3368 m. July 27, 2008 Snowbird, Utah. Deseret Peak 3362 m. June 29, 2008 Utah. Grosser Geiger 3360 m. April 21. 2018 Austria. Monte Perdido 3355 m. August 1999 3rd highest in the Pyrenees. Marmolada 3343 m. July 17. 2004 Dolomites HP. Adrar Bou Nasser 3340 m. June 20. 2017 Morocco. Cilindro de Marbore 3328 m. August 1999 Good name, 5th highest ? Etna 3326 m. July 17. 2005 Sicily HP. San Jacinto 3305 m. July 7. 2008 California. Keeskogel 3291 m. April 19. 2018 Austria. Mount Baker 3286 m. June 21. 2006 Washington, USA. Mount Graham 3269 m. July 17. 2008 Arizona, USA. Hasan Dagi 3268 m. July 17. 2016 Turkey. 250 Pilot Peak 3266 m. July 1. 2008 Nevada. Point 3266 3266 m. May 18. 2004 Nice peak with a good view. Gunung Lawu 3265 m. July 22. 2015 Java, Indonesia. Antelao 3263 m. August 30. 2013 King of the Dolomites, Italy. Haute Cime 3257 m. September 21. 2013 Final Ultra in the Alps! Switzerland. Flat Top Mountain 3237 m. June 30. 2008 Utah. Cerro de Monserrate 3223 m. January 17. 2012 and December 2. 2017 Bogota, Colombia. Glacier Peak 3206 m. August 11. 2010 Washington. Mount Jefferson 3199 m. August 20. 2010 Oregon, USA. Mount Cleveland 3194 m. August 5. 2012 Montana, USA. Kita 3192 m. August 14. 2016 Japan. Hotaka 3190 m. August 2. 2016 Japan. Lassen Peak 3187 m. July 1997 Volcano, last active 1921. Roundtop 3164 m. 3 times. Near Carson Pass, climbed on skis. South Sister 3157 m. August 18. 2010 Oregon, USA. Piz Boè 3152 m. March 28. 2003 Dolomites, Italy, What a lift operator! Cima Brenta 3151 m. September 14. 2013 Dolomites, Italy. Gunung Sindoro 3150 m. July 18. 2015 Java, Indonesia. Gunung Merbabu 3145 m. July 19. 2015 Java, Indonesia. Fansipan 3143 m. July 13. 2018 Vietnam HP. Cima Tosa 3139 m. July 19. 2009 Dolomites, Italy, Wrong Peak! Picachos El Centinela 3130 m. November 17. 2018 Mexico. Volcan Llaima 3125 m. January 21. 2015 Chile. Cerro el Centinela 3123 m. November 17. 2018 Mexico. Mount Washburn 3119 m. June 1997 Yellowstone National Park, Wyoming. Muttenhoerner 3099 m. August 1974 Near Furka Pass, Switzerland. Pico Duarte 3098 m. March 10. 2009 Dominican Republic HP. Piton des Neiges 3070 m. February 25. 2014 Reunion, Indian Ocean HP. Kizlar Sivresi 3070 m. July 6. 2016 Turkey. San Antonio 3068 m. July 6. 2008 California. N*N Ontake 3067 m. August 3. 2016 Did not summit, Japan. Pizzo Coca 3050 m. July 21. 2009 Italy. N*N Mount Aspiring 3033 m. January 7. 2015 Did not summit, New Zealand. Gunung Agung 3031 m. July 29. 2015 Bali HP., Indonesia. Hayford Peak 3025 m. November 10. 2006 Nevada, USA. Uyluk Tepe 3016 m. July 5. 2016 Turkey. Sacajawea Peak 2999 m. August 16. 2010 Oregon, USA. Star Peak 2999 m. October 18. 2005 Moonlight hike, Nevada. Hoher Dachstein 2995 m. July 2. 2006 Before DD17, Austria. McDonald Peak 2993 m. July 12. 2011 Montana, USA. Dedegol Tepesi 2992 m. July 12. 2016 Turkey. Chiricahua Peak 2986 m. July 15. 2008 Arizona, USA. Pic de Peguera 2982 m. July 1994 Highest in Aigües Tortes, Spain. Ta Chi Nhu 2979 m. July 12, 2018 Vietnam. Zugspitze 2962 m. August 8. 2005 Highest in Germany. Kisokomaga 2956 m. August 1. 2016 Japan. Mount Gelai 2948 m. January 8. 2019 Tanzania. Snowshed Peak 2947 m. July 15. 2008 Arizona, USA. Hochkönig 2941 m. August 12. 2005 Restaurant on top. Pine Mountain 2941 m. July 5. 2008 Traverse. Sacagawea Peak 2941 m. August 10. 2012 Montana, USA. Petermann Bjerg 2940 m. September 1996 and June 16. 1998 (5th ascent) Highest in Northeast Greenland. Musala 2925 m. July 5. 2013 Bulgaria HP. Olympos 2918 m. September 9. 2004 Greece HP. Whitecap Mountain 2918 m. August 25. 2004 British Columbia, Canada. Dawson Peak 2918 m. July 5. 2004 Traverse. Kutelo 2908 m. July 8, 2013 Bulgaria. Aka 2899 m. August 13, 2016 Japan. Wedge Mountain 2892 m. September 1. 2018 BC, Canada. Mount Tapuae-o-Uenuku 2885 m. January 12. 2015 New Zealand. Miller Peak 2885 m. July 14. 2008 Arizona, USA. Geyik Daglari 2877 m. July 13. 2016 Turkey. Mount Stuart 2870 m. August 27. 2010 Washington, USA. Mount Kitumbeine 2867 m. January 9. 2019 Tanzania. She Devil 2867 m. August 15. 2010 Idaho, USA. He Devil 2866 m. August 15. 2010 Idaho, USA. Cerro Kennedy 2866 m. December 1. 2015 Colombia. Volcan Lonquimay 2865 m. January 20. 2015 Chile. Mount Baden-Powell 2865 m. September 16. 2018 California. Triglav 2864 m. July 17. 2012 Slovenia HP. Hochgolling 2862 m. September 10. 2016 Austria. Villarrica 2860 m. January 22. 2015 Chile. Mount Seton 2855 m. August 23 2018 BC, Canada. Pic de Mont Valier 2838 m. July 1994 French Pyrenees. Pico do Fogo 2829 m. February 20. 2018 Cape Verde. Brekruna 2824 m. Second ascent, May 26. 2004 East Greenland. Haldensteiner Calanda 2806 m. October 4. 2014 Switzerland. Barla Dagi 2800 m. July 11. 2016 Turkey. Mount Ruapehu 2797 m. December 30. 2014 New Zealand. Grande Tete de L'Obiou 2790 m. July 11. 2007 Rock-fall !! Polinik 2784 m. September 12. 2007 A very nice day. Tobacor 2769 m. August 1999 Pyrenees. Maja e Korabit 2764 m. October 2. 2007 Albania and Macedonia HP. Pointe Percée 2753 m. July 15. 2007 Confused the two routes. Jôf de Montasio 2752 m. July 16. 2012 Italy. Mount Eddy 2751 m. June 28. 2008 Ultra no. 100, California. Overseer Mountain 2749 m. August 29. 2018 BC , Canada. Birkkarspitze 2749 m. June 29. 2013 Austria. Pico de Salvaguarda 2738 m. September 1997 Pyrenees. Acquaviva 2737 m. July 7 2012 Abruzzo, Italy. Jebel Kawr 2730 m. May 17. 2018 Oman. Montana de Guajara 2718 m. March 5. 2004 Across from Teide and 1000 meter lower. Colac 2715 m. July 18. 2004 Via Ferrata dei Finanzieri. 350 Monte Cinto 2706 m. July 11. 2005 Corsica HP. Haku-san 2702 m. August 5. 2016 Japan. Miriam Fjeld 2700 m. First ascent, June 25. 1998 Northeast Greenland. Half Dome 2695 m. July 1980 Yosemite, California. Maja Jezerce 2693 m. October 1. 2007 Albania. Mount Pinos 2692 m. September 19. 2018 California. Mt. Henkel 2673 m. June 1997 Glacier National Park, Montana. Guadaloupe Peak 2667 m. July 1993 Highest in Texas. Snowshoe Peak 2663 m. August 8, 2012 Montana, USA. Hohe Mut 2658 m. January 23. 2008 Ötztaler Alpen, Austria. Toro Peak 2657 m. September 22. 2018 California. Gerlach 2654 m. June 27. 2010 Tatra mountains, Slovakia HP. Volcan Osorno 2652 m. January 25. 2015 Chile. Gog 2651 m. 4th ascent, June 23. 1998 Northeast Greenland. Snefjeld 2650 m. First ascent, May 29. 2004 East Greenland. Torre de Cerredo 2648 m. October 6. 2008 Highest in Picos de Europa. Davraz Tepe 2635 m. July 13. 2016 Turkey. Smolikas 2637 m. July 14. 2010 2nd. highest in Greece. Dunn Peak 2636 m. August 2. 2018 BC, Canada. Birnhorn 2634 m. June 28, 2013 Austria. Mount Seton-S2 2634 m. August 23, 2018 BC, Canada.. Le Piton de la Fournaise 2632 m. February 26. 2014 Reunion. Kalifbjerg 2632 m. First ascent, June 12. 1998 Northeast Greenland. Picachos El Chena 2630 m. November 12. 2018 Mexico. Torger Fjeld 2630 m. First ascent, June 24. 1998 Northeast Greenland. Monte Rotondo 2622 m. July 8. 2005 Corsica. Torstind 2615 m. First ascent, June 14. 1998 Northeast Greenland. Manakau 2608 m. January 2. 2015 New Zealand. Pelister 2601 m. July 14. 2013 Macedonia. Torre de la Pardida 2596 m. October 5. 2008 Picos de Europa, Spain. Almanzor 2592 m. September 12. 1998 Highest in Sierra de Gredos Spain. Tvilling Bjerg 2590 m. First ascent, June 26. 1998 Northeast Greenland. Torsäule 2588 m. August 12. 2005 Beautiful peak. Ilgaz Daglari 2587 m. July 23. 2016 Turkey. NR Bear Peak 2579 m. 1983, 1997, 2000, 2002 Boulder, Colorado. Shirane 2578 m. June 30. 2015 Japan. Roque de la Grieta 2575 m. March 5. 2004 A memorable traverse. Piute Peak 2573 m. September 16. 2018 California. NR La Galana 2572 m. September 12, 1998 2nd highest in Sierra de Gredos, Spain. Tangent Fjeld (sydøst toppen) 2570 m. First ascent, June 12. 1998 Northeast Greenland. Doi Inthanon 2565 m. July 4. 2018 Thailand. Monte Camicia 2564 m. July 11. 2004 Gran Sasso, Italy. Kerberus 2564 m. 2nd ascent, June 27. 1998 Northeast Greenland. Mehlums Tinde 2560 m. First ascent, June 21. 1998 Northeast Greenland. Grintovec 2558 m. July 18. 2012 Slovenia. Kucukhacet Tepe 2550 m. July 23. 2016 Turkey. Mount St. Helens 2549 m. May 1989 Lost its top!, Washington (was 2950). Moldoveanu 2544 m. August 8. 2011 Romania Highest. Uludag Kara Tepe 2543 m. March 3. 2017 Turkey. Solunska Glava 2540 m. July 15. 2013 Macedonia. Montana Pasajiron 2529 m. March 5. 2004 A memorable traverse. Kaimaktsalan 2528 m. July 13. 2010 Greece. 400 Bobotov Kuk 2522 m. July 11. 2013 Montenegro. Paringul Mare 2519 m. August 9. 2011 Most prominent in Romania. Mount Taranaki 2518 m. December 29. 2014 New Zealand. Grosser Priel 2515 m. September 24. 2007 Austria. Grosses Ochsenhorn 2511 m. September 6. 2016 Austria. Lille Snefjeld 2511 m. First ascent, May 28. 2004 East Greenland. Giona (Piramidha) 2510 m. July 17. 2010 Greece. Birger Larsens Tinde 2510 m. First ascent, June 21. 1998 Northeast Greenland. Peleaga 2509 m. August 10. 2011 Romania. Birkenhead Peak 2506 m. August 10. 2018 BC, Canada. Säntis 2503 m. September 1. 2008 Switzerland. NR Topo de la Grieta 2502 m. March 5. 2004 No rank, but nice end of traverse. Rysy 2499 m. June 28, 2010 Poland HP. Monte Velino 2486 m. July 17, 2017 Abruzzo, Italy. Maja e Papingut 2482 m. July 20, 2013 Albania. Green Mountain 2482 m. August, 2000 Boulder, Colorado. Vettore 2476 m. July 8. 2012 Italy. Col Nudo 2471 m. July 14. 2004 Dolomites, Italy. Galdhøpiggen 2469 m. 3 times Highest in Norway. Arpasul Mare 2468 m. August 8. Romania. South Yolla Bolly Mountain 2467 m. October 23. 2011 California. Mount Shengena 2464 m. January 17. 2019 Gran Sasso, Italy. Glittertind ca. 2464 m. August 1991 2nd highest in Norway. Snowcap on top, height varies. Hiuchi 2462 m. June 29. 2015 Japan. Psiloritis 2456 m. September 14. 2006 Highest on Crete. Kootenay Mountain 2456 m. July 14. 2011 British Columbia. Liakoura 2455 m. September 10. 2004 Greece. Páchnes 2453 m. September 13. 2006 No. 2 in Crete. Kristine Fjeld 2449 m. First ascent, May 29. 2004 East Greenland. Cima del Redentore 2448 m. July 8. 2012 Italy. Triple Divide Peak 2444 m. June 1997 A very special geographic point. Frazier Mountain 2440 m. September 19. 2018 California. Fredericks Fjeld 2440 m. First ascent, June 14. 1998 Northeast Greenland. Double Mountain 2433 m. September 15. 2018 California, USA. Les Cornettes de Bise 2432 m. September 22. 2013 France/Switzerland. Raucheck 2430 m. May 30. 2010 Steep Ladder, Austria. Tehachapi Mountain 2430 m. September 15. 2018 Californbia, USA. Hvide Ryg 2430 m. First ascent, June 26. 1998 Northeast Greenland. Mount Olympus 2429 m. August 24. 2010 Washington, USA. Jebel Tidirhine 2428 m. JUne 18. 2017 MOrocco. Roque de los Muchachos 2426 m. March 15. 2019 Canary Islands. Agathias 2424 m. September 14. 2006. Crete, Greece. Volcan El Mocho 2422 m. January 23. 2015 Chile. Satan 2422 m. April 16. 1989 Strbske Pleso, Slovakia, Solo in fog. Varful Ucisoara 2418 m. October 27. 2007. Romania. Geierhaupt 2417 m. June 15. 2015. Austria. Larstind 2410 m. First ascent, June 21. 1998 Northeast Greenland. Profitis Ilias 2407 m. September 12. 2004 Peloponnese HP, Greece. Chieu Lau Thi 2402 m. July 15. 2018 Vietnam. 450 Mount Morrison 2402 m. November 17. 2017 With Sverre, Colorado. Mount Cronin 2396 m. August 20. 2018 BC, Canada. Picachos El Fraile 2400 m. November 15. 2018 Mexico. Emery Peak 2388 m. July 1993 Highest in Big Bend, Texas. Louise Toppene 2380 m. First ascent, June 27. 1998 Northeast Greenland. Rabben 2378 m. Second ascent, May 30. 2004 East Greenland. Killini 2376 m. September 12. 2004 Peloponnes, Greece. Botev 2376 m. July 7. 2013 Bulgaria. Maja Valamara 2373 m. October 4. 2007 Albania. Skardstinden 2373 m. September 29. 2002 5th highest in Norway. Reisskofel 2371 m. September 23. 2007 West of Villach, Austria. Tschirgant 2370 m. June 6. 2017 Near Imst, Austria. Hochtor 2369 m. October 16. 2007 Great climb, Austria. Vesle Galdhøpiggen 2369 m. May 18. 2002 6th highest in Norway. Surtningssui 2368 m. August 1995 7th highest in Norway. Hybens Bjerg 2360 m. First ascent, June 15. 1998 Northeast Greenland. Monte Renoso 2352 m. July 7. 2005 Corsica. Montanho do Pico 2351 m. July 22. 2014 Portugal HP, Azores. Grimming 2351 m. July 6. 2006 Austria. La Tournette 2351 m. July 14. 2007 Tour de France..
Pålsryg 2350 m. First ascent, June 17. 1998 Northeast Greenland. Monte Sirente 2349 m. July 18. 2017 Abruzzo, Italy. Ellmauer Halt 2344 m. August 13. 2005 Via Ferrata route. Storgjuvtinden 2344 m. May 19. 2002 12th highest in Norway. Store Knutsholstind 2341 m. August 1998 13th highest in Norway. Cima Dodici O Ferozzo 2336 m. July 16. 2004 Near Asiago, Italy. Mount Taylor 2333 m. January 5. 2015 New Zealand. Tjørnholstind 2330 m. August 1998 16th highest in Norway. Bai Yi Zhai (He Feng Jian) 2323 m. August 22. 2009 Heibei, China. Singlecone 2319 m. January 6. 2015 Remarkables HP, New Zealand. Bukkehøi 2314 m. May 19. 2002 17th highest in Norway. Kafir Peak 2314 m. August 27. 20018 BC, Canada. Breckenridge Mountain 2310 m. September 16. 20018 California. Store Tverråtinden 2309 m. May 20. 2002 18th highest in Norway. Pietrosul Rodnei 2303 m. August 12. 2011 Romania. Sungwi Mountain 2301 m. January 19. 2019 Lushoto, Tanzania. Pukeashun Mountain 2301 m. August 3. 2018 BC, Canada. Togano 2301 m. September 20. 2013 Italy. Revet 2300 m. First ascent, June 19. 1998 Northeast Greenland. Hochiss 2299 m. June 30. 2013 Austria. Cherni Vrah 2290 m. July 9. 2013 Bulgaria. Asahi Dake 2290 m. June 23. 2015 Hokkaido HP, Japan. Reyes Peak 2290 m. September 19. 2018 California. Baselfjeld 2290 m. First ascent, June 18. 1998 Northeast Greenland. Snøhetta 2286 m. 4 times Highest in Norway outside Jotunheimen. Monte Greco 2285 m. July 21. 2017 Abruzzo, Italy. Hochschwab 2277 m. June 14. 2015 Austria. La Roche Ecrite 2276 m. February 23. 2014 Reunion. 500 Dickens Bjerg 2275 m. First ascent, May 19 2000 Dronning Louise Land, North-East Greenland. Skorsteinseggi 2275 m. First ascent, May 30 2004 East Greenland. Monte Costone 2271 m. July 17. 2017 Abruzzo, Italy. Black Butte 2270 m. October 23. 2011 California. Serra Dolcedorme 2267 m. July 20. 2005 Parco Nazionale del Pollino, Italy. Mesmogtinden 2264 m. September 5. 2014 Jotunheimen, Norway. Point 2263 2263 m. May 27 2004 East Greenland. Besshø 2258 m. August 12. 2006 Good Memories, Jotunheimen, Norway. Monte Cadria 2254 m. July 13. 2012 Epic struggle!, Italy. Morton Peak 2250 m. July 15. 2011 Grizzly Bear! BC, Canada. Alamo Mountain 2249 m. September 19. 2018 California. Monte Pollino 2248 m. July 20. 2005 Parco Nazionale del Pollino, Italy. Grosser Pyhrgas 2244 m. September 28. 2014 Austria. Punta Trento 2243 m. July 17. 2017 Abruzzo, Italy. Latschur 2236 m. June 5. 2017 Austria. Hochstuhl 2225 m. June 3. 2017 Austria. Chokai 2236 m. June 26. 2015 Japan. Hoher Ifen 2230 m. June 6. 2010 Kleinwalsertal, Austria. Mount Kosciuszko 2228 m. July 2 2003 Highest on the Australian continent. Cima Undici 2228 m. July 16. 2004 Near Asiago, Italy. Le Cimandef 2228 m. February 28. 2014 Reunion. Abercrombie Mountain 2227 m. August 14. 2010 Washington, USA. Grosser Buchstein 2224 m. September 27. 2014 Austria. Storebjørn 2222 m. May 10. 2008 Sognefjellet, Norway. Cima di Valdritta 2218 m. July 20. 2004 The highest summit of Monte Baldo, Italy. Gunung Salek 2211 m. July 13. 2015 Java, Indonesia. Koussakas 2211 m. September 14. 2006 Crete, Greece. Store Smørstabbtinden 2208 m. May 10. 2008 Sognefjellet, Norway. Harney Peak 2207 m. June 1997 Highest in South Dakota. Langedalstinden 2206 m. September 5. 2014 Jotunheimen, Norway. Store Austabottind 2204 m. August 5. 2006 Jotunheimen, Norway. Jebel Khadar 2200 m. Mai 19. 2018 Oman. Saksi (Sokse) 2189 m. May 10. 2008 Sognefjellet, Norway. Gunung Yong Belar 2181 m. June 27. 2018 Malaysia. Cornetto 2180 m. September 22. 2007 Highest on Monte Bondone, Italy. Serra del Prete 2180 m. July 20. 2005 Parco Nazionale del Pollino, Italy. Rondeslottet 2178 m. August 10 2003 Highest in Rondane, Norway. Punktum 2175 m. Second ascent, May 24 2000 Dronning Louise Land, North-East Greenland. Store Svartdalspiggen 2174 m. September 5. 2014 Jotunheimen, Norway. Nordre Hestbrepiggen 2172 m. May 18 2013 Jotunheimen, Norway. Hvalross Fjeld 2170 m. First ascent, May 21 2000 Dronning Louise Land, North-East Greenland. Midzhur 2168 m. March 16 2013 Serbia/Bulgaria. Store Rauddalseggje 2168 m. September 6. 2014 Jotunheimen, Norway. Dobratsch 2166 m. June 3. 2017 Austria. Monte Cimone 2165 m. July 6 2007 Italy. Midtre Hestbrepiggen 2160 m. May 18 2013 Jotunheimen, Norway. 550 Uranostind 2157 m. August 6. 2006 Big struggle, Jotunheimen, Norway. Boz Dag 2156 m. July 3. 2016 Turkey. Monte Viglio 2156 m. July 19. 2017 Abruzzo, Italy. Mount Tod 2155 m. July 23. 2011 Walk in the park, BC, Canada. Snow Mountain 2151 m. October 24 2000 California. TWMC Fjeld 2150 m. First ascent, May 20 2000 Dronning Louise Land, North-East Greenland. Veslebjørn 2150 m. May 10. 2008 Sognefjellet, Norway. Dikti 2148 m. September 17. 2006 What a hot day! Crete, Greece. Wöllaner Nock 2145 m. June 3. 2017 Austria. Afentis Christos 2141 m. September 17. 2006 What a hot day! Crete, Greece. Snøholstinden 2141 m. August 12. 2008 Jotunheimen, Norway. Hochobir 2139 m. November 4. 2007 Austria. Storronden 2138 m. August 10 2003 2nd. highest in Rondane, Norway. NR Nordre Svartdalspiggen 2137 m. September 5. 2014 Jotunheimen, Norway. Ekecik Dagi 2133 m. July 21. 2016 Turkey. Kniven 2133 m. May 10. 2008 Sognefjellet, Norway. Cheops 2130 m. First ascent, May 21 2000 Dronning Louise Land, North-East Greenland. Dainichi 2128 m. June 28 2015 Japan. NR Mount Sanitas 2127 m. February 5th, 2001 Boulder, Colorado. Helgoland 2125 m. First ascent, May 28 2000 Dronning Louise Land, North-East Greenland. Store Ringstind 2124 m. March 25 2006 Jotunheimen, Norway. Maja e Kendrevicës 2121 m. October 5. 2007 Albania. Phu Soi Dao 2120 m. July 6. 2018 Thailand. Hvannadalshnukur 2119 m. May 15. 2016 Iceland HP. Spitzegel 2119 m. June 4. 2017 Austria. Bear Mountain 2115 m. September 15. 2018 California, USA. Høgronden 2115 m. August 1. 2010 Rondane, Norway. Mirnock 2110 m. November 4 2007 Austria. Stob Coire an Lochain 2110 m. Second ascent, May 27 2000 Dronning Louise Land, North-East Greenland. Iide san 2105 m. June 28 2015 Japan. Mount Tod, South peak 2104 m. July 23. 2011 Subsidiary peak to Mount Tod. BC, Canada. Kispiox Mountain 2096 m. August 21. 2018 BC, Canada. Hull Mountain 2095 m. October 24. 2011 California. Hestdalshøgdi 2091 m. May 19. 2013 Oppland, Norway. Punta de los Roques 2091 m. March 17. 2019 Palma, Canary Islands. Sarektjohkka 2089 m. May 28. 2007 Sarek HP. Green Mountain 2089 m. Many times Great run from Sverre's home. Sierra la Laguna HP. 2085 m. November 21. 2018 Mexico. Lazaros 2085 m. September 17. 2006 What a hot day! Crete, Greece. Lodalskåpa 2083 m. 5 times Highest nunatak on Jostedalsbreen. Chamechaude 2082 m. May 5 2006 Near Grenoble, France. N*N Raduc 2082 m. July 13 2013 Did not summit, Macedonia. Phu Khe 2079 m. July 8 2018 Thailand. Schneeberg 2076 m. October 7. 2007 Austria. Galdeberget 2075 m. March 9. 2013 Norway. Stølsnostind 2074 m. October 3. 2015 Norway. Maroma 2069 m. September 17 2016 Malaga, Spain. Fanaråken 2068 m. September 30 2017 Jotunheimen, Norway. Falketind 2068 m. April 16 2005 Jotunheimen, Norway. Kvitingskjølen 2064 m. May 12 2008 Jotunheimen, Norway. 600 Monte Morrone 2061 m. July 20. 2017 Abruzzo, Italy. Midtronden 2060 m. August 1. 2010 Rondane, Norway. Vestre Kvitingskjølen 2060 m. May 12 2008 Jotunheimen, Norway. Monte Miletto 2050 m. July 22. 2017 Italy. Iwate san 2038 m. June 25. 2015 Japan. Mount Mitchell 2037 m. March 10 2008 Highest in the East USA. Radomir 2031 m. July 12 2010 Greece. Mount Athos 2030 m. July 6 2010 Greece. Mallory Fjeld 2030 m. First ascent, May 25 2000 Dronning Louise Land, North-East Greenland. Gamsfeld 2027 m. October 1. 2014 Austria. NR Slingsbytinden 2026 m. August 6. 2006 Jotunheimen, Norway. Pap Bhàn 2025 m. First ascent, May 22 2000 Dronning Louise Land, North-East Greenland. Maja e Qorres 2018 m. July 18. 2013 Albania. Brenibba 2018 m. June 4. 2011 Jostedalsbreen, Norway. Sagtinden 2018 m. August 1. 2013 Rondane, Norway. Storesmeden 2016 m. August 1. 2013 Rondane, Norway. Digerronden 2016 m. August 1. 2010 Rondane, Norway. Volcan Calbuco 2015 m. January 26. 2015 Chile. Vesle-Smeden 2015 m. August 1. 2013 Rondane, Norway. Ø. Gråhøe 2014 m. February 14 2004 Oppland, Norway. Dot 2010 m. First ascent, May 24 2000 Dronning Louise Land, North-East Greenland. Monte Sirino 2005 m. August 1. 2017 Italy. Midtre Stølsnostind 2002 m. October 3. 2015 Jotunheimen, Norway. Cima di Mucchia di Pacentro 2001 m. July 20. 2017 Abruzzo, Italy. Hot Springs Mountain 1991 m. September 23 2018 California. Old Cook's Cairn 1990 m. First ascent, May 25 2000 Dronning Louise Land, North-East Greenland. Nunatak Dent 1990 m. Second ascent, May 29 2000 Dronning Louise Land, North-East Greenland. Walmendingerhorn 1990 m. June 4 2010 Conference walk, Kleinwalsertal, Austria. Hjelledalstinden Peak 1989 m. October 1. 2016 Jotunheimen, Norway. Cozzo del pellegrino 1987 m. August 4. 2017 Italy. Cuyamaca Peak 1985 m. February 11 2011 DD20, San Diego, California. Storskrymten 1985 m. Ocober 13 2013 Norway. Tope de Coroa 1982 m. February 17. 2018 Cape Verde. Tengu 1982 m. August 9 2016 Japan. Olavsbunuten 1970 m. March 1992 Ski climb, Jotunheimen. Babadag 1969 m. July 4. 2016 Drive up, Turkey. Kleneggen 1964 m. October 16 2004 Ski climb, Romsdalen. Skridulaupen 1962 m. March 6 2010 Did not summit. Oppland, Norway. Sonntagshorn 1961 m. September 5. 2016 Very wet! Austria. Aonach Mhòr 1960 m. First ascent, May 26 2000 Dronning Louise Land, North-East Greenland. Blåhøe 1959 m. February 14 2004 Oppland, Norway. Høgste Breakulen 1957 m. 10 times Highest on Jostedalsbreen. 650 Pico de las Nieves 1956 m. December 7. 2014 Gran Canaria. Pangaion 1956 m. July 8. 2010 Greece. Montalto 1956 m. July 18. 2005 Calabria, Italy. Tsurugi 1955 m. August 10. 2016 Japan. Olympos 1952 m. December 13. 2012 Cyprus HP. Volcan las tres Virgenes 1951 m. November 23. 2018 Mexico. Halla-san 1950 m. July 9. 2015 South Korea HP. Skridulaupen-east 1949 m. March 15. 2015 Oppland, Norway. Gråhøe 1945 m. February 14 2004 Oppland, Norway. Volcan de la Deseada 1944 m. March 16 2019 Palma, Canary Islands. Digerkampen 1944 m. February 14 2004 Oppland, Norway. Mid-Gletscher 1940 m. Second ascent, May 22 2000 Dronning Louise Land, North-East Greenland. Pangaion North East Top 1940 m. July 8. 2010 On the way to Pangaion. Stølsnosi 1935 m. April 16 2005 Jotunheimen, Norway. Kanalberget 1937 m. August 1973 Sarek in Sweden. Miyanoura 1936 m. August 7. 2016 Yakushima HP, Japan. Folarskardnuten 1933 m. October 1998, March 3. 2012 Hallingskarvet Norway. Jirogyu 1930 m. August 10. 2016. Japan. Botte Donaato 1928 m. August 2. 2017. Italy. N.Ø. Skålefjellet 1925 m. Many times in May Jostedalen Glacier, Norway. Høgeloft 1920 m. February 11 2006 Buskerud, Norway. Monte Mileto 1920 m. July 20. 2017 Abruzzo, Italy. Torrecilla 1919 m. November 21 2004 Highest in Malaga, Spain. Hochstadl 1919 m. June 13 2015 Austria. Mount Washington 1917 m. September 22 2008 New Hampshire state HP, USA. Sanbonyari 1917 m. August 16 2016 Japan. Oksskolten 1916 m. August 1972 Highest in Northern Norway. Hakken 1915 m. August 11. 2016 Japan. Cheonwangbong 1915 m. July 3. 2015 South Korea. Nasu (Chausu) 1915 m. August 16 2016 Japan. ICEsoft 1910 m. First ascent, May 20 2000 Dronning Louise Land, North-East Greenland. Trekanten 1910 m. Second ascent, May 22 2000 Dronning Louise Land, North-East Greenland. Suliskongen 1908 m. April 28 2007 Near Sulitjelma, Norway. Hallingskarvet 1905 m. March 4 2012 Buskerud, Norway. Ham Rong 1900 m. July 17 2018 Sapa, Vietnam. Puy de Sancy 1885 m. May 7 2006 Highest in Massiv Centrale. Hellevassfonni 1885 m. March 3 2012 Hallingskarvet, Norway. Sierra de Lújar 1878 m. December 21 2003 South of Sierra Nevada, Spain. Dürrenstein 1878 m. April 14. 2018 Austria. Jostedalsbreen 1874 1874 m. Many times, May skiing Jostedalsbreen, Norway. Palomar Mountain 1871 m. September 22, 2018 California. 700 Maja e Qiramanges 1863 m. July 22, 2013 Albania. Hardangerjøkulen 1863 m. May 9 2002, December 2 2012 Highest in Hordaland. Gunung Bintang 1862 m. July 1, 2018 Malaysia. Grosser Höllkogel 1862 m. November 19 2007 Austria, required two trips. Katran Dagi 1862 m. July 9 2016 Turkey. Tindefjellbreen 1861 m. May skiing Skåla to Lodalskåpa. Prestholtskarvet 1859 m. January 1992 South-East on Hallingskarvet. Pico Bejenado 1856 m. March 14 2019 Palma, Canary Islands. Ramnefjellbreen 1856 m. May 1 2012 Sogn og Fjordane, Norway. Plomb Du Cantal 1855 m. July 1 2012 France. Stolhyrna 1852 m. April 29 2017 Stryn, Norway. Store Trolla 1850 m. September 3 2005 1000 meter prominence in Southern Norway completed. Torvløysa 1850 m. May 6 2005 Tafjord, Norway. Cucurbata Mare (Bihor) 1849 m. August 11 2011 Romania. Skåla 1848 m. May 23 2002 Unique mountain hut. Gjerdeaksla 1848 m. April 30 2012 Sogn og Fjordane, Norway. Heimdalshø 1843 m. April 9, 1974 Reindeer at the summit. Såtbakkollen 1840 m. October 5, 2006 Sunndalen, Norway. Nordre Slotthøa 1837 m. October 6, 2006 Møre og Romsdal, Norway. Store Hånosi 1836 m. September 12, 2010 Sogn og Fjordane, Norway. Marmora 1834 m. July 15, 2005 Sardine HP. Jiehkkevarri 1834 m. April 30, 2005 Troms HP, Norway. Kjenndalskruna 1830 m. 4 times Nice view. Storsølnkletten 1827 m. June 7 2003 Alvdal, Norway. Snønipa 1827 m. April 18 2009 Jølster, Norway. Høgbrøthøgde 1821 m. March 10 2013 Jotunheimen, Norway. Pico Arieiro 1818 m. December 11 2011 Madeira, Portugal. Berdalseken 1814 m. January 31 2010 Filefjell, Norway. Gudo de Cavaleiro 1812 m. February 18 2018 Cape Verde. Point 1812 1812 m. November 21 2004 Malaga, Spain. Vikesaksa 1809 m. September 13, 2015 Norway. Blåskavlen 1809 m. July 4 2004 Aurland, Norway. Montana la Barquita 1809 m. March 16 2019 Palma, Canary Islands. Monte Cervialto 1808 m. July 30, 2017 Italy. Monte Terminio 1806 m. July 30, 2017 Italy. Tanzania Point 1805 1805 m. January 15, 2019 Tanzania. NR Pico Cidrao 1801 m. December 13, 2011 Madeira, Portugal. Helagsfjället 1797 m. January 6 2007 Sweden. Breitinden 1797 m. July 2 2009, October 18. 2015 Romsdal, Norway. Strandanibba 1796 m. April 30 2012 Sogn og Fjordane, Norway. Nakadake 1791 m. August 6. 2016 Japan. Schafberg 1782 m. July 5, 2006 Wolfgang, Austria. Gunung Karang 1778 m. July 14, 2015 Java, Indonesia. Sikkilsdalshøa 1778 m. March 5, 2010 Oppland, Norway. Veslebotnskarvet 1778 m. April 15, 2007 Near Hemsedal, Norway. Vennisfjellet 1776 m. February 15, 2008 Vang in Valdres, Norway. Monte Grappa 1775 m. July 11. 2012 Italy..
750 Hochkogel 1774 m. October 5, 2014 Austria. Unterberghorn 1773 m. September 11, 2016 Austria. Nord Saulo 1768 m. April 30, 2007 Near the border, but in Sweden. Norra Sytertoppen 1768 m. November 16. 2012 . Storsylen 1768 m. October 15, 1972 With an axe from Sweden. Monte San Petrone 1767 m. July 12, 2005 Corsica. Gravskardhøgda 1767 m. February 28, 2006 Hedmark, Norway. Vargebreen 1766 m. February 16, 2014 Near Finse, Norway. NR Angel's Landing 1765 m. July 1997 Zion National Park, exposed. Col Visentin 1763 m. July 11, 2012 Road hike. Stiganosi 1761 m. November 22, 2008 Sogn og Fjordane, Norway. Midtre Sølen 1755 m. June 8, 2003 Hedmark, Norway. Mont Mézenc 1753 m. July 2 2012 France. Kveita 1751 m. April 30, 2005 Lyngen in Troms, Norway. Mount Lolo 1748 m. July 24, 2011 Near Kamloops. BC, Canada. Heidalsmuen 1745 m. November 13, 2004 Strong wind on top, Oppland, Norway. Dirfis 1743 m. September 14, 2004 Évia, Greece. Veslfjellet 1743 m. August 1961 The high end of Besseggen. Storbarden 1742 m. February 13, 2016 Tafjordfjell, Norway. Mont Armetta 1739 m. July 4, 2012 Italy. Høgstolen 1739 m. March 17. 2018 Sunnmøre, Norway. Mont Amiata 1738 m. July 6, 2012 Italy. Hoemtinden 1734 m. August 11, 2017 Eikesdalen, Norway. Hauduken 1734 m. August 12, 2017 Eikesdalen, Norway. Point 1734 1734 m. April 15, 2007 Near Hemsedal, Norway. Santiago Peak 1733 m. September 21, 2018 California. Ramnabergnuten 1731 m. May 9 2002 Near Hardangerjøkulen. Frostisen 1724 m. April 30, 2016 Skjomen, Nordland, Norway. Sprangdalseggi 1723 m. April 6, 1974 Near Styggevatn, Breheimen. Rishiri Fujia 1721 m. June 22, 2015 Japan. Sandfloegga 1721 m. March 28, 2014 Hardangervidda, Norway. Simlepiggen 1721 m. March 1975 Ski climb, Rondane. Harbarsbreen 1720 m. April 6, 1974 Sunset. Njunis 1717 m. May 5, 2012 Troms, Norway. Ceciliekruna 1717 m. May 27, 2017 Olden, Norway. Storhøe 1716 m. November 3, 2013 Dovre, Norway. Årjep Saulo 1715 m. May 1, 2007 Sweden. Newtontoppen 1713 m. April 26, 2013 Svalbard High Point. Perriertoppen 1712 m. April 27, 2013 2nd. highest on Svalbard. Kvitegga 1710 m. May 30, 2003 Møre High Point. /td> Alberfeldkogel 1707 m. January 20, 2008 Austria. Meleinsnibba 1706 m. May 1 2012 Sogn og Fjordane, Norway. Tarven 1703 m. April 24, 2010 Near Myrdal, Norway. NR Lillsylen 1702 m. October 15, 1972 No Rank, In Sweden. Kråkvasstinden 1700 m. February 22, 2013 Near Oppdal, Norway. Kvigtinden 1699 m. September 10, 2011 Nordland, Norway. Nordre Sølen 1699 m. June 8, 2003 Hedmark, Norway. Mont Lozère 1699 m. July 2, 2012 France. S. Knutshøa 1690 m. November 2, 2013 Dovre, Norway. Hårteigen 1690 m. September 22, 2001 King of Hardangervidda. 1690 NW of Storsølnkletten 1690 m. June 7 2003 Alvdal, Norway. 800 Søre Sølen 1688 m. June 8, 2003 Hedmark, Norway. Dyrtjørnhøi 1687 m. March 4, 2010 Oppland, Norway. Skaget 1686 m. October 8, 2010 Oppland, Norway. Fremsta Ryssenipa 1685 m. June 30, 2009 Sogn og Fjordane, Norway. Kirkestinden 1677 m. May 11, 2012 Troms, Norway. N*N Standing Indian 1676 m. March 11, 2008 Did NOT summit. North Carolina. Modjeska Peak 1675 m. September 21, 2018 California. Nupsegga 1673 m. January 19, 2013 Extremely cold! Telemark/Hordaland, Norway. Blåhøa 1671 m. May 13, 2008 Trollheimen, Norway. Gjegnen 1670 m. April 27, 2003 Avalanche, Norway. Monte Cairo 1669 m. July 24, 2017 Italy. Snota 1669 m. March 18, 2007 Trollheimen, Norway. Ingulssjøhøi 1667 m. March 5, 2010 Oppland, Norway. Tronden 1666 m. June 9, 2003 Alvdal, Norway. Holmbukttind 1666 m. April 30, 2005 Lyngen in Troms, Norway. Folgefonnen (South summit) 1662 m. May 1998 Highest on Folgefonnen glacier. Storebreen 1662 m. November 22, 2008 Sogn og Fjordane, Norway. Stavsnuten 1661 m. March 30, 2014 Hardangervidda, Norway. Rohkunborri 1659 m. May 4, 2005 Remote peak in Troms, Norway. Piatra Graitoare 1658 m. August 11, 2011 Romania. Vassdalseggi 1658 m. March 18, 2012 Haukeli, Norway. Pico Grande 1654 m. December 12, 2011 Madeira, Portugal. Pico Ruivo do Paul da Serra 1649 m. December 12, 2011 Madeira, Portugal. Skippers Range HP. 1648 m. January 9. 2015 New Zealand. Folgefonnen (North summit) 1644 m. May 1998 Folgefonnen glacier. Høg-Gia 1641 m. July 31, 2010 Hedmark, Norway. Skomanosi 1641 m. January 13, 2007 Fjellsport trip. Grovabreen 1636 m. May 2, 2010 Sogn og Fjordane, Norway. Baksafjellet 1636 m. December 29, 2003 Reminds me of my son. Vassfjøra 1633 m. December 28, 2003 Kaldevass. Store Smørskredtind 1631 m. September 20, 2003 Sunnmøre, Norway. Mount Marcy 1630 m. October 1980 Highest in New York. Whale Peak 1630 m. September 23, 2018 California. Høgbrøtet 1630 m. March 10, 2013 Jotunheimen, Norway. Store Lenangstind 1625 m. August 2. 2005, June 1. 2007 18 hour snow climb. Satertind 1623 m. September 20. 2015 Nordland, Norway. Onen 1621 m. May 18, 2003 Hordaland, Norway. Mount Ossa 1617 m. January 16, 2015 Tasmania HP, Australia. Blåhø 1617 m. March 3, 2006 Oppland, Norway. Breifonn 1616 m. March 29, 2014 Hardangervidda. Store Flåtten 1616 m. April 1988 Hardangervidda. Geitfjellet 1615 m. September 2, 2017 Geiranger, Norway. Sundfjordbjørnen 1615 m. May 9, 2004 Meneseggi traverse. Trollhetta 1614 m. March 16, 2007 Trollheimen, Norway. Kongen 1614 m. October 17, 2015 Romsdalen, Norway. Madari 1613 m. December 15, 2012 Cyprus. Store Grananuten 1613 m. September 22, 2001 3rd highest Hardangervidda north. 850 Sundhellerskarvet 1613 m. October 1997 Highest on Geiteryggen. Fegari 1611 m. July 10, 2010 Greece. Pourianos Stavros 1610 m. July 18, 2010 Home of the Centaurs. Fedalsnibba 1609 m. May 31, 2003 Near Strynsvatnet. Taskedalstinden 1609 m. November 1, 2015 Valldalen, Norway. Blåøret 1605 m. February 23, 2013 Oppdal, Norway. Elgspiggen 1604 m. February 17, 2008 Hedmark, Norway. Mount Lafayette 1603 m. September 23, 2008 New Hampshire, USA. Storhornet 1600 m. May 14, 2015 Sunnmøre, Norway. Store Finsenuten 1599 m. March 8, 2016 Hardangervidda, Norway. Monte D'Avella 1598 m. July 28, 2017 Italy. San Benito 1597 m. March 27, 2007 California. Nordre Trollhetta 1596 m. March 16, 2007 Trollheimen, Norway. Nordre Sålekinna 1595 m. February 18, 2008 Hedmark, Norway. Psili Korifi 1589 m. July 15, 2010 Greece. Storhornet 1589 m. March 11, 2005 Snow and limmited views. Vassdalsfjellet 1587 m. April 27, 2009 Fantastic Tour! Råna 1586 m. August 19, 2013 Sunnmøre, Norway. Blåbergnuten 1585 m. March 29, 2014 Hardangervidda, Norway. Skruven 1584 m. September 3, 2017 Sunnmøre, Norway. Gilafjellet 1584 m. January 30, 2010 Valdres, Norway. Skorafjellet 1583 m. March 8, 2013 Hordaland, Norway. Harahorn 1581 m. April 15, 2007 Near Hemsedal, Norway. SE-Storlogpiken 1578 m. May 27, 2017 Olden, Norway. Olsskavlen 1576 m. January 21, 2007 Test of repair kit, Hordaland Norway. Nonstinden 1573 m. October 21, 2006 Still no winter. Mont Aigoual 1565 m. July 2 2012 France. Storviglen 1561 m. August 1970 East of Røros. Sveigen 1561 m. Summer 1991 Haukeli, Norway. Siljak 1560 m. March 17, 2013 Serbia..
Nordre Langsuen 1553 m. February 1998 Highest in Gausdal Vestfjell. Mannfjellet 1552 m. June 13, 2011 Troms, Norway. Fossdalsskavelen 1551 m. November 23, 2008 Sogn og Fjordane, Norway. NR Skavteigfjellet 1548 m. May 1 2012 Sogn og Fjordane, Norway. Høgstoplan 1547 m. October 31, 2015 Sunndalsøra, Norway. Melsnipa 1547 m. May 8, 2004 Meneseggi traverse. Roman-Kosh 1545 m. January 25, 2014 Crimea, Ukraine. Didnojiehkki 1544 m. September 19, 2010 The top is melting. Gråhøgda 1543 m. July 31 2010 Hedmark, Norway. Skårasalen 1542 m. May 1 2003 Sunnmøre, Norway. Papoutsa 1542 m. December 15 2012 Cyprus. Monte Cocuzzo 1541 m. August 2. 2017 Cyprus. Brattefjell 1540 m. March 2 2010 Telemarkøre, Norway. 900 Skaulen 1538 m. January 29, 2006 Near Sauda in Rogaland, Norway. Kvannefjellet 1537 m. February 13, 2010 Telemark, Norway. Monte Semprevisa 1536 m. July 23, 2017 Italy. Monte Asto 1535 m. July 10 2003 Corsica. Monte Petrella 1533 m. July 25, 2017 Italy. N*N' Seljebottinden 1531 m. March 18, 2018 Norway, did not succeed. Blåegga 1530 m. February 16 2003 On the way to Botnafjellet. Lille Russetind 1527 m. May 8, 2005 Troms, Norway. Sætredalsfjellet 1526 m. May 15, 2015 Sunnmøre, Norway. Bukkenibba 1520 m. August 2, 2013 Bremanger, Norway. Grøtet 1519 m. April 30, 2017 Sunnmøre, Norway. Knutshøi 1517 m. August 1998 Scenic ridge, near Gjende Lake. Ruten 1516 m. November 5, 2005 Espedalen, Norway. Gjendestunga 1516 m. August 1991 West of Gjende Lake. Flosteinnibba 1514 m. May 17. 2015 Sunnmøre, Norway. Coccovello 1512 m. August 5. 2017 Italy. Biellogaisa 1510 m. June 11, 2011 Troms, Norway. Solo, 12.5 hours! Grøndalsnipa 1509 m. May 9, 2004 Meneseggi traverse. Sæbyggjenuten 1507 m. February 14, 2010 Øst-Agder HP, Norway. Snøhetta 1506 m. May 7, 2005 Troms, Norway. Friken 1506 m. April 17. 2005 and October 2. 2016 Jotunheimen, Norway. Overvollshornet 1502 m. May 17. 2015 Sunnmøre, Norway. Malpaso 1501 m. December 4. 2014 El Hierro HP, Spain. Vassetnipa 1501 m. May 10. 2015 Jordalen, Norway. NR Avleinsfjellet 1500 m. May 1 2012 Sogn og Fjordane, Norway. Queimadas 1500 m. December 16 2011 Big effort! Madeira, Portugal. Giljabotnnipa 1499 m. February 15 2015 Hordaland, Norway. Storbua 1498 m. March 18 2018 Sunnmøre, Norway. Istind 1495 m. June 12 2011 Lyngen, Norway. Gråhøa 1493 m. November 2 2013 Oppdal, Norway. Gottopphesten 1492 m. May 9, 2004 Meneseggi traverse. Austre Låghellerhøgdene 1492 m. March 7. 2016 Hardangervidda, Norway. Kvitegga 1489 m. May 16, 2015 Sunnmøre, Norway. NR Saueggi 1488 m. May 8, 2004 Soft Rank, Meneseggi traverse. Tverrviglen 1486 m. August 1970 East of Røros. Store Ishaug 1485 m. April 1. 2014 Hardangervidda, Norway. Eidskyrkja 1482 m. May 3 2003 Nice ski slopes! Møre, Norway. Dalmannshornet 1476 m. May 1 2017 Sunnmøre, Norway. Afentis Stavromenos 1476 m. September 16. 2006 Road to the top, East Crete, Greece. Dalsnibba 1476 m. September 1. 2017 Road to the top, Geiranger, Norway. Skjorta 1472 m. October 16. 2010 Sogn og Fjordane, Norway. Mjølfjell 1470 m. October 17. 2009 Hordaland, Norway. Fivlenosi 1466 m. May 2. 2010 Doubleheader, Sogn og Fjordane, Norway. Gråfjell 1466 m. August 14. 2006 Orienteering, Norefjell, Norway. Bjørnabreen 1464 m. September 26. 2010 Sogn og Fjordane, Norway. Bispen 1462 m. October 17, 2015 Romsdalen, Norway. Elgåhogna 1460 m. February 16, 2008 Engerdal HP, Norway. Brasstown Bald 1458 m. March 11, 2008 Georgia (US) HP. Stav 1458 m. April 29 2006 An attempt on Sogndalseggi. Spanstinden 1457 m. May 12, 2005 Troms, Norway. Juklavasskruna 1455 m. August 17, 2003 West of Folgefonnen, Norway. Veslsølnkletten 1454 m. June 7 2003 Alvdal, Norway. 950 Horntind 1454 m. October 4. 2015 Tyin, Norway. Vestre Låghellerhøgdene 1453 m. March 5. 2016 Hardangervidda, Norway. N. of Melsnipa 1446 m. May 8, 2004 Meneseggi traverse. Monte San Michele (Molare) 1444 m. July 29, 2017 Italy. Cobb Mountain 1443 m. March 4, 2018 California. Trollvasstinden 1441 m. September 18, 2010 2nd. attempt, Lyngen, Norway. Fongen 1441 m. February 1972 Ski climb, Trøndelag. Kaldanuten 1437 m. February 19, 2017 Voss, Norway. Chao dos Terreiros 1436 m. December 14, 2011 Madeira, Portugal. Pico do Serradinho 1436 m. December 15, 2011 Madeira, Portugal. Lauparen 1434 m. August 18, 2013 Sunnmøre, Norway. Kvitanosi 1433 m. September 7, 2008 Hordaland, Norway. Storhaugane 1433 m. March 5. 2016 Hardangervidda, Norway. Kolåstinden 1432 m. May 2, 2003 Famous peak, Sunnmøre, Norway. Joju-sha 1431 m. August 9. 2016 On the way to Tengu, Japan. Vassdalsnipa 1430 m. May 8, 2010 Sogn og Fjordane, Norway. Store Skrekken 1429 m. December 1973 New Years Eve + Hurricane. Vestre Storhaugane 1428 m. March 5. 2016 Hardangervidda, Norway. Melderskin 1426 m. April 23, 2005 Rosendal Alps, Norway. NR Bjørndalstindane 1426 m. August 17, 2003 Soft Rank, North of Folgefonnen, Norway. Mælefjell 1415 m. September 4, 2004 Big river, Telemark, Norway. Spåtind 1414 m. 18 times Ski climb, Oppland. Kaldafjellet 1411 m. January 28. 2018 Voss, Hordland, Norway. Lønahorgi 1410 m. April 23, 2016 Ski trip Vikafjell-Voss, Norway. Kvasshornet 1409 m. April 10, 2015 Ski climb, Sunnmøre, Norway. Harevollnipa 1406 m. May 8, 2004 Meneseggi traverse. Hamperokken 1404 m. June 12, 2004 Fine ridge traverse. Holmanuten 1399 m. January 22, 2017 Hordaland, Norway. Åbittinden 1396 m. November 1, 2014 Romsdal, Norway. Monte Taburno 1394 m. July 26, 2017 Italy. Pico da Antonia 1393 m. February 21, 2018 Cape Verde. Tverrbakktinden 1392 m. June 6, 2008 Lyngen, Norway. Søre Grøndalsnuten 1384 m. March 5. 2016 Hardangervidda, Norway. Midtvigelen 1381 m. August 1970 East of Røros. Hjerttinden 1380 m. May 2, 2005 Troms, Norway. Mount Sonder 1380 m. July 22. 2003 4th. highest in the Northern Territory, Australia. Blåtindan 1378 m. May 3, 2005 Troms, Norway. Ustetind 1376 m. February 23, 2003 South of Ustaoset. Grøndalsfjellet 1375 m. March 11, 2013 Vikafjellet, Norway. Viromkjerringa 1374 m. June 22, 2013 Nordmøre, Norway. Skorve (Gøysen) 1370 m. April 9, 2005 Telemark, Norway. Søre Svartkampen 1366 m. October 9, 2010 Oppland, Norway. Vigelpiken 1361 m. August 1970 East of Røros. Asash Dagi 1360 m. July 7. 2016 Turkey. Finnbunuten 1358 m. February 6. 2005 Myrkdalen, Hordaland, Norway. Vehuskjerringa 1355 m. September 11. 2006 Telemark, Norway. Helldalisen 1351 m. August 18, 2014 Steigen, Norway. Hjortahorgi 1351 m. September 1998 Highest between Voss and Hardanger. Ben Nevis 1344 m. August 1975 Highest in Great Britain. 1000 Dalegubben 1344 m. October 7. 2006 Sunnmøre, Norway. Store Ble 1342 m. January 21. 2017 Telemark, Norway. Mount Mansfield 1339 m. September 21. 2008 Vermont state highpoint, USA. Eggjenipa 1338 m. June 30. 2017 Midnight Climb! Fuglafjellet 1334 m. September 29, 2001 Highest in Kvamskogen. Leigastinden 1332 m. May 1. 2016 Gratangen, Norway. Matøskja 1332 m. January 31. 2009 Sunnmøre, Norway. Forolhogna 1332 m. Feb. 1973 Ski climb, Trøndelag. Copernicus Peak 1330 m. February 28, 2008 Santa Clara HP, California. Nystulnuten 1329 m. January 21. 2017 Telemark, Norway. Trollhøtta 1328 m. October 11, 2014 Trollheimen, Norway. Indre Sula 1325 m. June 23. 2013 Nordmøre, Norway. Djuptjernkampen 1325 m. March 24. 2005 Great trip with PJ. Skreieggi 1324 m. April 23. 2016 Vikafjell to Voss, Norway. Monsbunuten 1324 m. March 25. 2012 Haugastøl, Norway. Stortind 1320 m. June 11, 2004 Troms, Norway. Skrott 1320 m. January 4, 2004 Ski climb, quite a struggle. Storebrekkuna 1319 m. April 23, 2016 Vikafjellet to Voss, Norway. Larsfonnberget 1318 m. Decmber 20, 2009 Ski climb, deep snow, hard work. Fremstegretta 1315 m. May 8, 2004 Meneseggi traverse. Mount Konocti 1310 m. March 3, 2018 California. Snøhornet 1309 m. February 11, 2012 Sunnmøre, Norway. Blægja 1304 m. May 1. 2004 Great views and a nice ridge. Saudehornet 1303 m. May 1. 2011 Sunnmøre. Kazaroho 1300 m. January 8. 2019 Tanzania. Trollhøtta NW 1299 m. October 11, 2014 Trollheimen, Norway. Pelineo 1297 m. July 1988 Highest on Chios, Bullen Bax. Glitregga 1297 m. January 4, 2003 Snow and fog, large primary factor. Karaldenuten 1295 m. August 31, 2014 Voss, Norway. Blåfjellet 1293 m. September 26, 2003 Nordland, Norway. Runderabben 1292 m. October 5, 2012 Hordaland, Norway. Røysdalsnuten 1291 m. March 3, 2010 Telemark, Norway. Cahto Peak 1290 m. March 3, 2018 California. Vetlafjellet 1290 m. January 29, 2017 DNT mountaineering trip. Voss, Norway. Trollvasstinden 1285 m. January 5, 2003 Fantastic scenery, my first in Møre og Romsdal. Kvanngrødhorga 1282 m. February 26, 2017 Jondal, Norway. Langlitinden 1277 m. November 20, 2011 Extremely nicve climb!, Troms, Norway. Vassdalstinden 1277 m. July 3, 2017 Sunnmøre, Norway. Eggjane 1268 m. February 11, 2018 Hordaland. Urfjellet 1267 m. January 7, 2005 Very nice views, Møre og Romsdal. Kourtellorotsos 1266 m. December 15, 2012 Cyprus. Skjerjavasshovden 1264 m. April 18, 2015 Hordaland, Norway. Prosten 1263 m. July 5, 2017 Romsdal, Norway. Manfjellet 1263 m. February 25, 2018 Hordaland, Norway. Møysalen 1262 m. August 23, 2014 Hinnøya HP, Norway. Reitetinden 1260 m. September 1, 2012 Troms, Norway. Iendafjellet 1260 m. September 29, 2001 3rd. Highest in Kvamskogen. Midtfjell 1255 m. October 27, 2002 Struggle in the steep snow. Jolgrøhornet 1253 m. February 18, 2006 Sunnmøre, Norway. Gavlen 1251 m. June 11, 2016 Fusa, Norway. Stormauken 1249 m. May 11, 2005 Troms, Norway. Storkjølhaugen 1248 m. May 6, 2016 Trøndelag, Norway. Ulvanosa 1246 m. December 28, 2002 Large primary factor. Løksetinden 1242 m. May 13, 2005 Last and tough T5 peak, Troms, Norway. Grim 1242 m. October 1, 2017 Hordaland, Norway. Raudaberget 1242 m. February 28, 2016 Hordaland, Norway. Oksen 1241 m. June 15, 2008 Hordaland, Norway. Tromsdalstind 1238 m. June 1988 Midnight climb. Setnesfjellet 1238 m. August 13. 2017 Åndalsnes, Norway. Åvasstinden 1233 m. July 4, 2017 Sunnmøre, Norway. Roaldshornet 1230 m. October 22, 2006 Walk between the clouds. Store Kågtind 1228 m. June 1, 2008 Troms, Norway. Lille Forra 1228 m. August 16, 2014 Nordland, Norway. Skopphornet 1226 m. October 13, 2012 Sunnmøre, Norway. Rasmustind 1224 m. May 1, 2005 Troms, Norway. Montana de Tauro 1219 m. December 6, 2014 Gran Canaria, Spain. Iglfjellet 1218 m. January 1972 Ski climb, Trøndelag. N*N Paegun-san 1218 m. July 4. 2015 Investigated, NOT climbed!, Korea. Nord av Ingerbakktinden 1215 m. September 17. 2015 Nordland, Norway. Lavangstinden 1215 m. May 9. 2012 Troms, Norway. Grjótskálarhnjúkur 1214 m. May 17. 2016 Iceland. Blåtinden 1214 m. May 7, 2017 Sunnmøre, Norway. Geitadalstind 1210 m. December 28, 2002 Twin summit. Kvamshesten 1209 m. October 25, 2003 Extreme views. NxN Haugane 1208 m. November 27, 2016 Voss, Norway. Karltinden 1206 m. Troms, Norway. Øksfjordjøkelen 1204 m. May 30, 2008 Finnmark, Norway. Leirtinden 1203 m. May 6, 2005 Troms, Norway. Taklinatten 1202 m. January 20, 2013 Buskerud, Norway. Ryssdalshornet 1201 m. October 10, 2010 Sogn og Fjordane, Norway. NR Mount Alyeska 1201 m. September 1981 Alaska. No rank, The small mountain goat! Blåeggi 1172 m. April23, 2016 Vikafjell to Voss, Norway. St. Mary Peak 1171 m. July 14 2003 Highest in Flinders Ranges, South Australia. Trollahorgi 1171 m. April 18, 2015 Hordaland, Norway. Trolltinden 1170 m. February 19 2006 Sunnmøre, Norway. Bentsjordtinden 1169 m. June 9, 2004 Troms, Snow and fog. Næremstindan 1169 m. October 14, 2012 Sunnmøre, Norway. 1100 Arnøyhøgda 1168 m. May 31, 2008 Troms, Norway. Kaldbakur 1167 m. May 17. 2014 Iceland. Grønahorgi 1166 m. April 8, 2008 Voss, Norway. Giilavárri 1163 m. March 29, 2019 Lyngen, Norway. Bergsbukken 1162 m. January 27, 2019 Vaksdal, Norway. Resfjellet 1161 m. February 22, 2009 Meldal, Norway. Heimdalhaugen 1159 m. September 11, 2011 Nord-Trøndelag, Norway. Loma Prieta 1154 m. March 26, 2007 Santa Cruz Mountains, California. Breidviktinden 1154 m. November 12, 2005 Nordland, near Bodø, a long day. Pico de Mijas 1150 m. September 15, 2016 Malaga, Spain. Svarteknibba 1150 m. October 25, 2009 Sogn og Fjordane, Norway. Blåtinden 1142 m. May 10, 2005 Troms, Norway. Blæja 1142 m. October 12, 2012 Sunnmø,re, Norway. N*N Midtiskartinden 1135 m. March 24, 2017 Hordaland, Norway. Kjerringafjellet 1134 m. October 8, 2011 Hordaland, Norway. Høgahorgi 1133 m. February 4, 2007 Hordaland, Norway. Blåvasshorgi 1133 m. January 12, 2014 Hordaland, Norway. Mykletveitveten 1131 m. February 11, 2007 Hordaland, Norway. Monte Della Stella 1130 m. July 31, 2017 Italy. Amurga 1129 m. December 3, 2014 Gran Canaria, Spain. Småbrekkebukken 1129 m. April 22, 2017 Hordaland, Norway. Ormtjernkampen 1123 m. April 1995, 2002 Ski climb, Oppland. Norway's highest growing spruce forest. Molden 1122 m. March 26, 2006 Sogn og Fjordan, Norway. Bjørnaknausen 1121 m. April 22, 2017 Hordaland, Norway. Slettinden 1115 m. April 25, 2009 Troms, Norway. Uløytinden 1114 m. May 10, 2005 Troms, Norway. Tverrfjellet 1114 m. February 22, 2015 Voss, Norway. Vinjanuten 1105 m. November 28, 2004 Most prominent peak in Rogaland. Breidfjellet 1103 m. November 1, 2014 Romsdal, Norway. Pico da Vara 1103 m. July 29, 2014 Sao Miguel island, Azores. Høganovi 1101 m. October 8, 2016 Kvamsskogen, Norway. Skjervungen 1098 m. February 23. 1968 Climbed about 15 times. Tianzi Mountain 1098 m. August 20. 2009 Hunan Zhangjiajie national Forest Park, China. Svolefjellet 1097 m. February 22, 2015 Voss, Norway. Sætertind 1095 m. May 12, 2005 Troms/Norland, Norway. Kvasshornet 1094 m. February 4, 2012 Sogn og Fjordane, Norway. Storegreggen 1094 m. January 21, 2018 Hardanger, Norway. Pictet Bjerge 1093 m. September 1996 Antarctichavn, Greenland, Helge Ingstad. Ullstinden 1093 m. August 16. 2015 Troms, Norway. Kalddalsknippen 1090 m. January 1972 Big scare!! N*N Mount Juneau 1090 m. May 8, 2011 Did not summit. Alaska, USA. Nevelfjell 1089 m. Before 1960. Near Lillehammer. Sassafras Mountain 1085 m. March 11, 2008 South Carolina HP. Yr Wyddfa 1085 m. July 1996 Snowdon, highest in Wales. Hjerttindtuva 1080 m. May 2, 2005 On the way to Hjerttinden. Hamlagrøhornet 1080 m. February 11, 2007 Hordaland, Norway. Trollskarnuten 1080 m. January 23, 2016 Hordaland, Norway. 1150 Seilandstuva 1078 m. September 1, 2007 Finnmark, Norway. Vikanuten 1078 m. June 28, 2009 Hordaland, Norway. Caveiro 1076 m. July 22, 2014 Pico island, Azores. Brokefjellet 1074 m. October 4, 2009 Telemark, Norway. Gråhorgi 1074 m. January 25, 2004 Bergsdalen, Norway. Botnkrona 1072 m. September 27, 2003 Highest of The Seven Sisters, Alsten, Norway. Myssmørhelje 1072 m. Often Near Åltjern, Norway. Blåskjerdingen 1069 m. January 8, 2006 Møre og Romsdal, Norway. Giljafjell 1069 m. January 21, 2018 Hardanger, Norway. Blåfjellet 1067 m. November 13, 2010 Sogn og Fjordane, Norway. Monte Calvo 1065 m. July 27, 2017 Italy. Kvasshovden 1065 m. January 26, 2013 Hordaland, Norway. NR Prestkjerringa 1065 m. August 10. 1958, now about 150 times. Excellent views, near Åltjern, Norway. Montana de Hogarzales 1062 m. December 8, 2014 Gran Canaria, Spain. Heilhornet 1058 m. September 25, 2003 Nordland, Norway. Olafsfjardarfjell 1055 m. May 18, 2016 Iceland. Heidarhorn 1055 m. May 21, 2016 Iceland. Esperança 1053 m. July 23, 2014 Jorge island, Azores. Soltindan 1051 m. August 15, 2015 Ringsøy, Norway. Nordenskiöldfjellet 1051 m. November 10, 2016 Svalbard, Norway. Cerro Mirador 1048 m. January 27, 2015 Chile. Skarven 1048 m. November 2, 2014 Romsdal, Norway. Vesoldo 1046 m. November 1, 2003 Sea level start. Hordaland, Norway. Byrkjefjellet 1046 m. January 14, 2018 Hordaland, Norway. Kråktinden 1045 m. August 17, 2014 Steigen, Norway. Store Blåmann 1044 m. June 13, 2004 Kvaløya HP, Troms, Norway. Cabeço Gordo 1043 m. June 21, 2014 Faial, Azores. Skitntinden 1042 m. August 14. 2015 Troms, Norway. Ruten 1039 m. February 21 2009 Hemne, Sørtrøndelag, Norway. Storkjelen 1038 m. August 20 2013 Sunnmøre, Norway. Monte Maggiore 1037 m. July 27 2017 Italy. Skjerdingen 1037 m. September 27 2003 3rd. sister, 7 sisters, Alsten, Norway. Fugltinden 1033 m. April 26 2009 Troms, Norway. Løsethornet 1032 m. October 11 2012 Sunnmøre, Norway. Vanntinden 1031 m. May 9, 2005 Troms, Norway. Skamdalshorgi 1029 m. January 19, 2014 Hordaland, Norway. Hermannsdalstinden 1027 m. August 24, 2014 Lofoten, Norway. Snøtind 1027 m. February 18, 2007 North of Molde, Norway. Melshogna 1026 m. 1971-1975 Near Hognabu, Norway. Selvili Tepe 1024 m. December 14 2012 HP Northern Cyprus. Botnanuten 1024 m. September 8 2018 Hordaland, Norway. NR Hærfjellet 1024 m. Often Soft rank, Near Verskei, Norway. Drangen 1022 m. August 31, 2012 Troms, Norway. Santa Barbara 1021 m. July 28, 2014 Terceira, Azores. Eidetinden 1020 m. November 5, 2006 Nordland, Norway. Høgafjellet 1020 m. November 24, 2013 Hordaland, Norway. Grytfoten 1019 m. September 27 2003 2nd. sister, 7 sisters, Alsten, Norway. Bunuten 1019 m. 1987? Hardanger, Norway. Nylsfjellet 1018 m. April 20, 2014 Torpa, Norway. Roholtfjellet 1017 m. October 3, 2009 Telemark, Norway. Kjettberget 1016 m. About 30 times. Oppland, Norway. Nona 1012 m. November 19, 2011 Grytøya HP. 1200 Breidtinden 1010 m. September 2, 2012 Senja HP, Troms, Norway. Trollfjellet 1010 m. June 3 2007 Tjeldøya HP. Grotoes 1006 m. July 22, 2014 Pico island, Azores. Dystingen 999 m. August 20 2017 Vaksdal, Norway. Reinsfjellet 996 m. September 4 2005 Møre og Romsdal, Norway. Tindastóll 995 m. May 19, 2016 Iceland. Sandhornet 993 m. April 27 2007 South of Bodø, Norway. Krokvassfjellet 993 m. April 1, 2015 Oppland, Norway. Gulfjellet 987 m. More than 10 times Highest point in Bergen. Seilandsjøkelen 985 m. September 1, 2007 Finnmark, Norway. Tinden 982 m. September 28 2017 Voss, Norway. Tvillingan S 980 m. September 27 2003 5th. sister, 7 sisters, Alsten, Norway. Scafell Pike 978 m. August 1975 Highest in England. Hjelmen 978 m. June 21, 2013 Nordmøre, Norway. Gråfjellet 978 m. January 15, 2017 Hordaland, Norway. Ottanosi 976 m. February 16. 2013 Hordaland, Norway. Stormoa 975 m. September 23. 2017 Senja, Norway. Skagsåsen 972 m. January 20. 2017 Buskerud, Norway. Skorseteggi 972 m. February 8. 2015 Hordaland, Norway. Kvænan 963 m. September 22. 2017 Senja, Norway. Ramstadvarden 962 m. November 22, 2015 Sunnmøre, Norway. Sydpolen 962 m. March 14, 2006 South summit on Gulfjellet, Bergen, Norway. Kjerringa 960 m. September 2, 2007 Finnmark, Norway. Slettefjellet 958 m. November 10, 2013 Hordaland, Norway. Kråkhugukampen 952 m. April 17, 2014 Nordre Land, Norway. Storfjellet 950 m. May 24, 2006 Grand Tour! Ålesund, Norway. Trælafjellet 950 m. August 8, 2015 samnanger, Norway. Gløveret 949 m. January 13, 2018 Hordaland, Norway. Sandstone Peak 948 m. November 4 2018 Mexico. NR Tvillingan N 945 m. September 27 2003 4th. sister, 7 sisters, Alsten, Norway. Pico dos Frades 942 m. July 23. 2014 Sao Jorge, Azores. Mount Ohlssen Bagge 942 m. July 13. 2003 South Australia. Reinsfjellet 941 m. Winter 1975 Sør-Trøndelag, Norway. Koppefjellet 940 m. February 5, 2012 Møre og Romsdal, Norway. Flæfjellet 939 m. March 18, 2017 Hordaland, Norway. Keipen 938 m. September 24. 2017 Senja, Norway. Håfjellet 937 m. April 5. 2003 Long drive, short hike. Store Rundfjellet 936 m. May 29. 2016 Troms, Norway. Hjellafjellet 933 m. April 22. 2017 Hordaland, Norway. Tverrfjellet 932 m. April 13. 2013 Rosendal, Norway. Knuskedalsfjellet 928 m. March 12. 2016 Hordaland, Norway. Lugnaquillia 925 m. July 25. 1991 Near the Monastary of Glendalough, Ireland. Barrosa 924 m. July 29. 2014 Sao Miguel island, Azores. Liadalsnipa 924 m. April 30. 2011 Steep and airy, Sunnmøre, Norway. Kvanngrødfjellet 920 m. April 27. 2008 Sogn og Fjordane, Norway. Stetinden 920 m. March 31. 2019 Lyngen, Norway. Te Ahu Patiki 919 m. January 14. 2015 New Zealand. Flatafjellet 916 m. August 20 2017 Vaksdal, Norway. 1250 Storhompen 916 m. May 6. 2005 On the way to Leirtinden. Storafjellet 915 m. March 18, 2017 Hordaland, Norway. Morro Alta 914 m. July 25. 2014 HP on Flores island, Azores. Esja (Habunga) 914 m. May 14. 2016 Iceland. Talstadhesten 913 m. February 17. 2007 Near Molde, Norway. Saksa 912 m. June 21, 2013 Nordmøre, Norway. Monte San Salvatore 912 m. September 18, 2013 Lugano, Switzerland. Inderbergsalen 908 m. August 27. 2006 Highest island summit in southern Norway. Storøyra 905 m. August 27. 2006 Stabblandet, Norway. Skarven 899 m. August 26. 2006 Tustna, Norway. Strengen 890 m. June 23. 2013 Nordmøre, Norway. Malmangersnuten 890 m. April 14. 2013 Rosendal, Norway. Nordskarfjellet 890 m. March 24. 2017 Nordland, Norway. Svartevassegga 889 m. May 16. 2008 Bremanger, Norway. Monte Escuro 889 m. August 1. 2014 Sao Miguel, Azores. Grytetippen 887 m. September 24. 2017 Senja, Norway. Fagerfjellet 884 m. May 6. 2012 Troms, Norway. Reinskartinden 883 m. May 21. 2014 Reinøya, Troms. Hellandshornet 883 m. May 24. 2006 Last peak on the Tour of Storhornet. Høgenipa 877 m. March 22. 2003 West of Dale, Hordaland, Norway. Tsukuba-san 877 m. August 15. 2016 Japan. Sandvikshornet 876 m. March 10. 2007 Sunnmøre, Norway. Pico das Éguas 873 m. July 31. 2014 Sao Miguel, Azores. Høgafjellet 868 m. March 23. 2003 HP on Osterøy, Hordaland, Norway. Uluru 865 m. July 18. 2003 Most famous rock in Australia. Grytenuten 863 m. March 6. 2005 Struggle in deep snow, vertical X-mas trees. Hornelen 860 m. May 16. 2008 Bremanger, Norway. Jørenvågsalen 857 m. August 26. 2006 Tustna, Norway. Kvamsnova 855 m. August 20. 2017 Vaksdal, Norway. Burlifjellet 855 m. August 8. 2015 Samnanger, Norway. Fossabotsnakkane 853 m. November 7. 2015 Fusa, Norway. Blåfjellet 851 m. June 16. 2013 Masfjorden, Norway. NR Pico da Cruz 851 m. July 30. 2014 Sao Miguel, Azores, Lost its rank? Kinnkjølen 848 m. March 26. 2018 Gausdal, Oppland, Norway. Lomskollen 844 m. May 11. 2008 Lom, Oppland, Norway. Sveningen 842 m. February 13. 2005 2nd.highest in the city of Bergen. Urfjellet 839 m. May 24. 2006 Near Ålesund, Norway. Hestafjellet 839 m. October 29. 2017 Dale, Norway. Gongrøra 835 m. February 18. 2007 North of Molde, Norway. Kvitfjellet 833 m. March 11. 2007 Near Åndalsnes, Norway. Hood Mountain 832 m. March 5. 2018 Santa Rosa, California. Gunlanuten 829 m. May 21. 2006 Rogaland, Norway. Våkefjellet 826 m. February 27. 2016 Hordaland, Norway. Brøknipa 822 m. December 14. 2003 Storm on the summit. Todalsfjellet 821 m March 13. 2005 Route between two maps. Skorafjellet 821 m November 7. 2015 Fusa, Norway. Våganipen 819 m November 9. 2003 Nice view, large primary factor. Austlendingen 812 m June 8. 2013 Lindås, Norway. Austlirinden 808 m Many times Near Gulfjellet, Bergen. Daurmålsegga 807 m February 9. 2013 Hordaland, Norway. 1300 Kjøringvassfjellet 806 m October 13. 2017 Nordtrøndelag, Norway. Grytefjellet 805 m June 25. 2016 Hordaland, Norway. Rundfjellet 803 m April 6. 2018 Lofoten, Norway. Steinsethorgi 796 m September 26. 2017 Granvin, Hordaland, Norway. Gamlemsveten 791 m February 12. 2012 Sunnmøre, Norway. Stor-Kjølen 790 m May 10. 2012 Troms, Norway. Børdalsfjellet 789 m March 18. 2017 Hordaland, Norway. Storebøra 785 m February 5. 2012 Møre og Romsdal, Norway. Flatafjellet 785 m May 21. 2017 Vaksdal, Hordaland, Norway. Juhtar 785 m April 29. 2007 East of the Čoarvi hut, Nordland, Norway. Hausdalshorga 784 m January 23. 2005 Nice peak on Gulfjellet. Kistefjell 782 m May 1, 2005 Troms, Norway. Mount Tamalpais 782 m 1977 Marin County HP, Brake failure. Lifjell 777 m October 21. 2007 Sogn og Fjordane, Norway. Tverrfjellet 776 m May 25. 2006 Sula island HP, Ålesund, Norway. Unnamed top SE of Marcela 769 m July 26. 2014 Flores island, Azores. Melen 768 m November 6. 2010 Nordmøre, Norway. Lavangstinden 767 m May 12. 2012 Troms, Norway. Lukefjellet 767 m October 22. 2016 Fusa, Norway. Søtefjellet 767 m February 26. 2012 Os, Norway. San Marino 755 m July 13. 2004 Worlds oldest free republic. Tysnessåta 753 m April 24. 2003 Highest on Tysnes, Norway. Mekknoken 751 m November 7. 2010 Nordmøre, Norway. Sonoma Mountains High Point 751 m March 4. 2018 Santa Rosa, California. Monte Verde 750 m February 18. 2018 Cape Verde. Mehammarsåta 749 m April 24. 2003 Highest on Stord, Norway. Rispingen 742 m November 4. 2012 Osterøy, Norway. Gråhorga 740 m January 21. 2006 Highest in Ølen, Rogaland, Norway. Justadtinden 740 m April 8. 2018 Lofoten, Norway. Slåttenuten 738 m June 16. 2018 Kvam, Norway. Oppstadhornet 737 m April 6. 2008 HP Otrøya, Møre og Romsdal, Norway. Døldarheia 735 m May 20. 2006 Rogaland, Norway. St. Hilarion 732 m December 14. 2012 Northen Cyprus. Brossviksåta 723 m November 26. 2005 Sogn og Fjordane, Norway. Salsfjellet 723 m June 5. 2016 Hordaland, Norway. Corvo island HP, 720 m July 27. 2014 Corvo island, Azores. Skåldalsfjellet 719 m January 9. 2005 Near Arna, Norway. Hananipa 718 m September 23. 2012 Vaksdal, Hordaland, Norway. Storenuten 718 m April 2. 2017 Vaksdal, Hordaland, Norway. Svarttjernshøgda 717 m 1968 Highest in Nordmarka. Fjetlandsnuten 716 m January 28. 2006 Rogaland, Norway. Cerro Oncol 715 m January 28. 2015 Chile. Raudnipa 712 m September 23. 2012 Samnanger, Hordaland, Norway. Vassfjellet 711 m February 11. 2019 Trondheim, Norway. Gygrekjeften 710 m October 21. 2007 Sogn og Fjordane, Norway. Krånipa 707 m September 23. 2012 Samnanger, Hordaland, Norway. Bølia 703 m November 8. 2010 Nordmøre, Norway. 1350 Veten 702 m November 17. 2012 South of Mo i Rana, Norway. Eagle Mountain 701 m 1997 Highest in Minnesota. Korsbakkfjellet 694 m November 7. 2010 Nordmøre, Norway. Kvamsfjellet 694 m March 16. 2014 Osterøy, Norway. Skalten 692 m November 6. 2010 Nordmøre, Norway. Høgfjellet 689 m November 8. 2010 Nordmøre, Norway. Madeira Seca 684 m July 25. 2014 Flores island, Azores. Heggdalshornet 684 m April 6. 2008 Otrøya, Møre og Romsdal, Norway. Livarden 683 m Several times Visible from our kitchen. Kongsvollen 683 m February 1, 2009 Sunnmøre, Norway. Ulriken 673 m 1986-2004 The local mountain. Horga 673 m November 4. 2017 Hordaland, Norway. Vedafjellet 673 m May 12. 2013 Osterøy, Norway. Snjonipa 669 m March 23. 2014 Osterøy, Norway. Såtefjellet 666 m November 3. 2012 Osterøy, Norway. Fusafjellet 665 m December 19. 2004 Weather turned ugly. Steinen 663 m May 26. 2018 Kvam, Norway. Sollia 661 m May 1. 2011 Running with Arnt. Haukåsen 661 m June 16. 2018 Kvam, Norway. Sonvesåsen 654 m September 26. 2017 Voss, Norway. Prestkona 646 m August 19. 2014 Steigen, Norway. Monte San Biagio 644 m August 2. 2017 Italy. Akrafjall 643 m May 21. 2016 Iceland. Stongfjellet 640 m April 7. 2013 Osterøy, Norway. Møsnuken 639 m April 10. 2008 In Os, Hordaland, Norway. Skredvarden 636 m November 13. 2010 Sogn og Fjordane, Norway. Nathorst Fjeld 630 m May 17. 2000 North of Constable Pynt, North-East Greenland. Freikollen 629 m August 27. 2006 Courtesy SAS, Frei island HP, Norway. Svartfjell 629 m September 3. 2007 Finnmark, Norway. Blåtinden 621 m June 12. 2000 Svolvær, Lofoten, Norway. Mont Vinaigre 614 m July 3. 2012 France. NR Storlitinden 614 m November 19. 2011 Harstad, Norway. Veten 613 m February 4. 2012 Måløy, Norway. Nonklettfjellet 612 m June 16. 2013 Romarheim, Norway. Haddalshornet 611 m February 1, 2009 Sunnmøre, Norway. Varden 600 m August 16. 2006 Hardanger, Norway. Rødsfjell 591 m June 15. 2013 Fusa, Norway. Stemmeseggi 574 m November 25. 2012 Hordaland, Norway. Vestrefjellet 573 m September 29. 2013 Hordaland, Norway. Rundemannen 568 m Many times 1986-2010 Bergen, Norway. Storheia 566 m 1970-1975 Trondheim HP, Norway. Heilhillerhornet 558 m November 5. 2016 Hordaland, Norway. Tveitafjellet 556 m March 3. 2013 Osterøy, Norway. Gråkallen 554 m February 6. 2018 Trondheim, Norway. 1400 Vardafjellet 552 m April 6. 2014 Osterøy, Norway. Giskafjellet 550 m May 15. 2014 Kvinnherad, Norway. Crveni Cot 542 m March 18. 2013 Serbia. Haugafjellet 541 m June 18. 2016 Hordaland, Norway. Totlandsfjellet 540 m October 23. 2016 Hordaland, Norway. Sauafjellet 539 m September 9, 2012 Samnanger, Hordaland, Norway. Rødsfjellet 526 m April 15. 2012 Os, Hordaland, Norway. Bergsfjellet 521 m April 17. 2016 Fusa, Hordaland, Norway. Revurefjellet 519 m February 17. 2013 Fusa, Hordaland, Norway. Aksla 514 m November 14. 2016 Fusa, Hordaland, Norway. Monte Trigo 503 m July 23. 2014 Jorge island, Azores. Hikletten 494 m March 22. 2014 Osterøy, Norway. Håvikamulen 490 m June 18. 2016 Hordaland, Norway. Såta 489 m April 1. 2017 Hordaland, Norway. Cabeço Verde 488 m July 19. 2014 Azores. Kallvikanipa 488 m March 23. 2014 Osterøy, Norway. Serra Gorda 487 m July 31. 2014 Sao Miguel, Azores. Pina 487 m March 23. 2014 Osterøy, Norway. Veten 486 m November 27. 2010 Bergen, Norway. Gråfjellet 486 m April 14. 2012 Os, Norway. Senafjellet 479 m November 20. 2016 Fusa, Norway. Løvstakken 477 m 1986-2008 Bergen, Norway. Siggjo 474 m November 2. 2008 Hordaland, Norway. Erstadfjellet 466 m November 25. 2012 Hordaland, Norway. Høgstefjellet 464 m November 20. 2010 Bergen, Norway. Borgundnuten 462 m February 27. 2015 Hordaland, Norway. Hæddena 462 m January 6. 2013 Osterøy, Norway. Solbakkafjellet 461 m December 5. 2010 Bergen, Norway. Stadsheia (Herbernheia) 460 m 1970-1975 Bymarka, Trondheim, Norway. Raunalifjellet 458 m April 27. 2014 Osterøy, Norway. Bergsåstoppen 458 m August 27. 2017 Asker, Norway. Djupedalseggene 448 m May 26. 2013 Osterøy, Norway. Bogafjellet 444 m April 10. 2016 Fusa, Norway. Steinen 439 m November 6. 2016 Fusa, Norway. Rotten 438 m June 1. 2013 Osterøy, Norway. Trollevassnibba 432 m February 27. 2015 Hordaland, Norway. Solemsvåttan 423 m February 5. 2018 Trndheim, Norway. Skardalsfjellet 421 m April 12. 2008 Bergen, Norway. Gibraltar 416 m November 20. 2004 Famous Rock. Geitfjellet 416 m 1970-1975 Bymarka, Trondheim, Norway. Veten on Snilstveitøy 409 m Mai 14. 2014 Rosendal, Norway. Lysehornet 405 m 1998? Os, Hordaland, Norway. Lyderhorn 396 m Many times Bergen, Norway. Øyjordsåsen 396 m November 6. 2016 Fusa, Norway. Raudlifjellet 396 m November 28 2010 Bergen, Norway. Selifjellet 395 m April 19 2013 Lindås, Norway. 1450 Beljaråsen 395 m April 9 2016 Fusa, Norway. Storåsen 394 m August 27 2016 Fusa, Norway. Blåberga 332 m February 5. 2018 Trndheim, Norway. Verafjellet 314 m April 27. 2014 Osterøy, Norway. Russåsen 292 m August 27 2016 Fusa, Norway. Sverrestuven 289 m April 6. 2014 Osterøy, Norway. Morro de Castelo Branco 145 m July 20 2014 Faial, Azores. NR Marni Hill 84 m December 6., 2000 PSV HP. NR Le Mont Saint-Michel 80 m June 28, 2012 Famous tidal rock, France. 1569 Masada 50 m Mai 1999 Israel, 440 meter vertical! My sons Tor and Pål have climbed some of these mountains too, Pål has a list of his most prominent summits here. By further exploring this web site you acknowledge that the information presented here may be out of date or incorrect, and you understand that the owner of this site has NO responsibility for any damages, injuries, or death arising from any use of this site. Please thoroughly investigate any mountain before attempting to climb it., and do not substitute this web site for experience, training, and recognizing your limitations! Please see the acknowledgements, many thanks to friends for help and assistance.